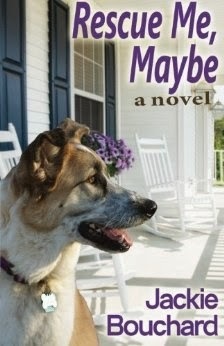 Rescue Me, Maybe was a refreshing and cute tale of a woman with a life in transition. It showed how we can hurt those we love yet they don't give up on us. It showed that people can surprise us with their goodness. It showed that life goes on despite losing the ones we love. It also showed that dogs can be good friends through it all. I liked how this book was realistic and touched on sensitive topics like falling out of love with someone, the issues we can have with our family members and in laws and also cancer. I was surprised and pleased at how sensitively these topics were addressed and how realistic the situations were written to be. Jane was definitely going through tough times and was trying to figure out where she wanted to be. All she really knew was that she was unhappy and deeply so. I liked the fact that she took the lessons life threw at her and learnt from them. Everything was taken in stride minus a few little hiccups along the way but then again who doesn't try to fight against life sometimes? I was expecting this book to be solely about the relationship between Jane and Maybe, the dog she unexpectedly rescued. But I was pleasantly surprised to find that it was just one element in the story, one that was deftly woven throughout the entire story in a very realistic and enjoyable way. Maybe became a strong point in the story and an underlying source of strength to Jane herself. I also liked how Rescue Me, Maybe ended. I was expecting some of it to happen and some things I expected to happen didn't which was great because then it was not too predictable and happy ending-ish which kind of concerned me. I am very happy to have discovered this author, as she is new to me, and I will definitely be keeping my eye on her in the future as Bouchard writes from the heart and there is nothing I love better. Thank you to Jackie Bouchard for our review copy. All opinions are our own.